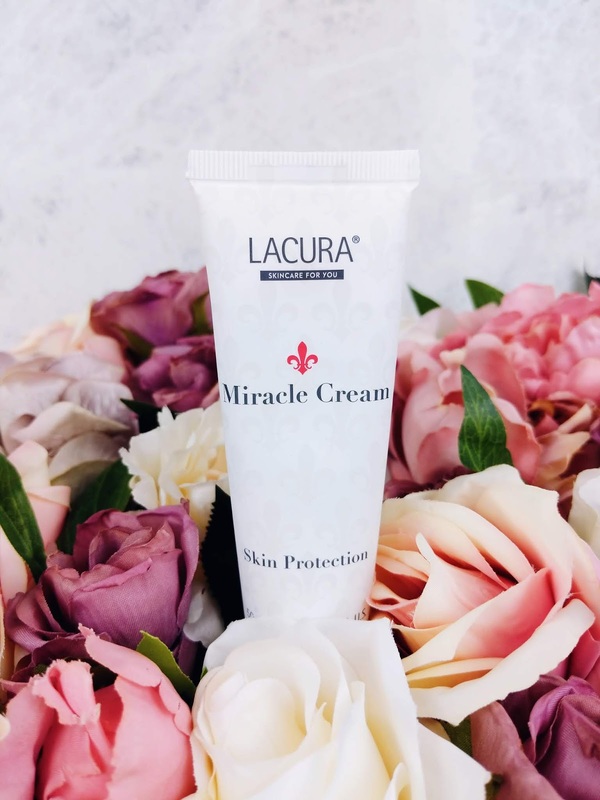 Over the past few weeks, Instagram has gone crazy over the new range of Lacura Skincare items Aldi has been stocking in its stores. Now, we can all appreciate a good bargain and in this day and age for a lot of us, it is about saving pennies where we can. But a supermarket releasing a skincare range, can that be any good? And what if this supermarket pushes the boundaries with packaging so similar to that of bigger, more renouned, luxury skincare brands? When does an item become a dupe? In this post, I am directly comparing Aldi dupes to the 'real thing', considering packaging and ingredients, whilst reviewing the product itself. Let's start at the beginning. What is a dupe? Dupe is short for duplicate, in this case meaning a duplicate of a product that looks very similar to the original, high-end product, but does not necessarily perform the same way the high-end product does. There are usually differences in quality of ingredients. One might contain higher percentages of active ingredients, or may be more naturally derived than the other. A couple of weeks ago, Aldi released their Lacura Healthy Glow, an exfoliating toner that contains 5% Glycolic Acid, Aloe Vera and Ginseng. 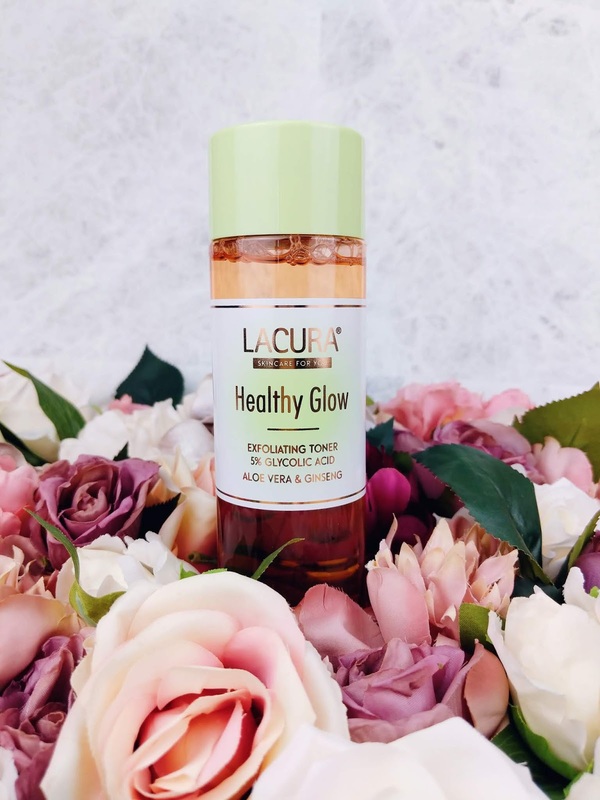 Looking at the packaging, it's pretty obvious that the Lacura Healthy Glow is practically a copy of the very famous Glow Tonic by Pixi Beauty. The orange bottle with light green lid really does not leave much to the imagination. Aqua, Glycolic Acid, Butylene Glycol, Glycerin, Sodium Hydroxide, Betaine, Polysorbate 20, Phenoxyethanol, Allantoin, Hamamelis Virginiana Water, Benzophenone-4, Disodium EDTA, Parfum, Ethylhexylglycerin, Aloe Barbadensis Leaf Juice Powder, Panax Ginseng Root Extract, Potassium Sorbate, Sodium Benzoate, Linalool, Geraniol, Hexyl Cinnamal, Caramel, CI 14700. The ingredients look very similar at first sight, however there are differences. One thing to remember is that ingredients are listed in order of predominance, with the ingredient appearing in the greatest amount at the top. 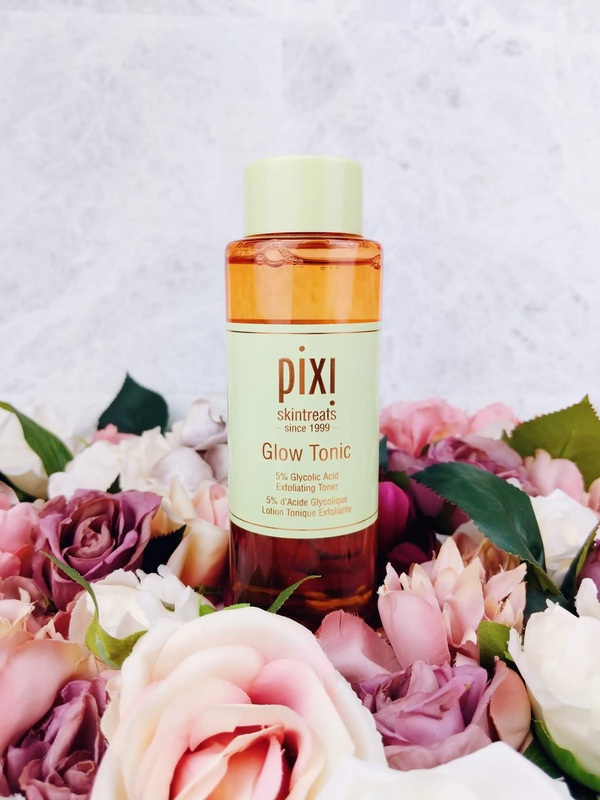 With that in mind, I notice that the active ingredients such as Glycolic Acid, and Aloe Vera are at the top of the list when it comes to the Pixi Beauty Glow Tonic. Although the same goes for the Glycolic Acid in the Lacura Healthy Glow, the Aloe Vera is mentioned in the bottom half of the ingredients, and I notice that it is Aloe Vera leaf juice powder whereas the Glow Tonic mentions leaf juice. Overall the amount and quality of the natural ingredients appears to be better in the Glow Tonic than the Lacura Healthy Glow. Looking at both tonics, the scent is very similar. The Lacura tonic has a slightly stronger smell. I've tried the Lacura tonic on the left side of my face whilst using the Pixi Glow Tonic on the right side and both feel and act similarly, leaving my skin cleansed and toned. Next up is a skin protecting cream. 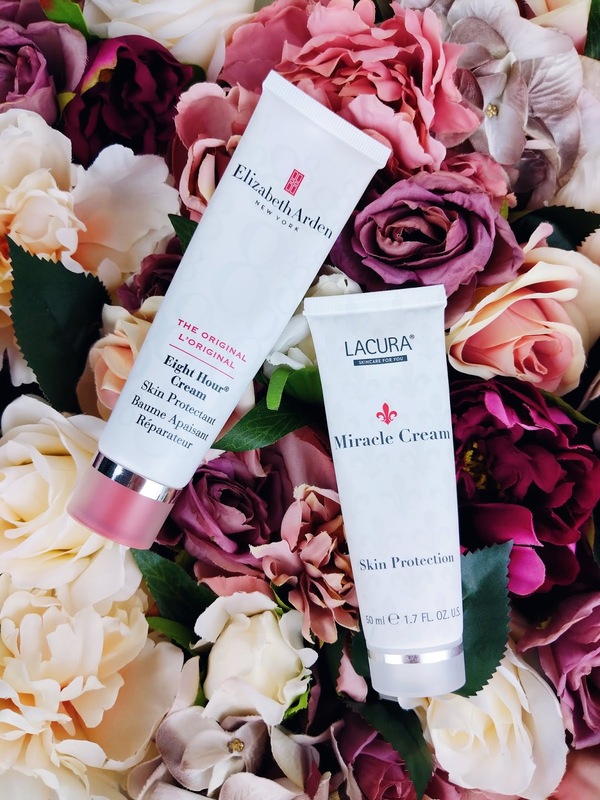 Both the Elizabeth Arden Eight Hour Cream and the Lacura Miracle Cream promise to soothe and moisturise dry skin and even help shape eyebrows! Again, Lacura has not been very inventive when it comes to the packaging, and the similarities are hard to overlook. Petrolatum 56.8%, Lanolin, Mineral Oil, Fragrance, Salicylic Acid, Propylparaben, Castor Oil, Corn Oil, Tocopherol, BHT, Iron Oxides. Please note that the Eight Hour Cream does contain more ingredients, however I was unable to find the full list. Petrolatum, Paraffinum Liquidum, Ricinus Communis Seed Oil, Olus Oil, Lanolin, Salicylic Acid, Tocopherol, Zea Mays (Corn) Oil, BHT, Helianthus Annuus Seed Oil, Ascorbyl Palmitate, Tocopheryl Acetate, Phenoxyethanol, Ethylhexylglycerin, Parfum, Amyl Cinnnamal, Benzyl Benzoate, Butylphenyl Methylpropional, Citral, Citronellol, Geraniol, Hydroxycitronellal, Hydroxyisohexel 3-Cyclohexane Carboxaldehyde, Limonene, Linalool, Synthetic Fluorphlogopite, CI 75120, CI 77491. The active ingredients in both creams are very similar and appear in a similar order in the ingredients list. Interestingly, the Elizabeth Arden Eight Hour Cream states that once opened, the cream has a lifespan of 36 months, whereas the Lacura Miracle Cream states the cream can be kept for 6 months. This does make me wonder what's causing this difference. When it comes to using the creams, both have a very similar appearance as can be seen in the picture below. The Eight Hour Cream has a stronger, more 'medical' scent than the Miracle Cream, which smells more subtle and fragranced. The Eight Hour Cream has a thicker consistency than the Miracle Cream, which I find better for a petroleum jelly based cream as it offers a more intense nourishment. The difference is also noticeable when using the cream on dry skin. 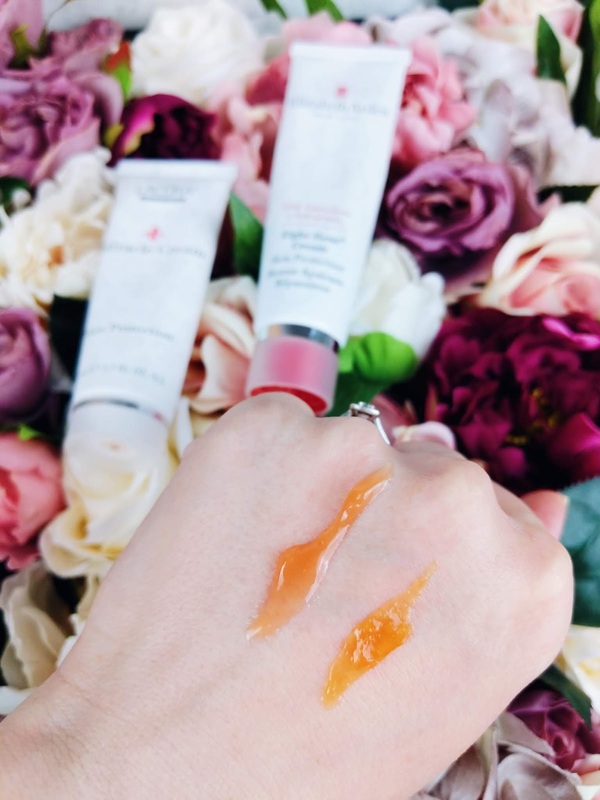 I've tried both creams on my dry skin, and I noticed that the Miracle Cream is absorbed by my skin within 1-2 hours, whereby the Eight Hour Cream stays on my skin a lot longer, offering that eight hour intense treatment. I find that the Miracle Cream would be a good intense hand cream, but would have to be reapplied a number of times onto really dry skin. The Eight Hour Cream is more suitable to really dry, chapped skin that just needs that little bit more. The last items I want to compare in this post are the Molton Brown and Aldi hand washes. Molton Brown has been one of my favourite luxury brands for a number of years now and I was kind of surprised to see one so similar at Aldi. Water (Aqua), Sodium Laureth Sulfate, Laureth-4, Fragrance (Parfum), Punica Granatum Fruit Extract, Lonicera Caprifolium (Honeysuckle) Flower Extract, Lonicera Japonica (Honeysuckle) Flower Extract, Butylene Glycol, Propylene Glycol, Caprylic/Capric Triglyceride, Lauryl Alcohol, Myristyl Alcohol, Peg-40 Hydrogenated Castor Oil, Ethylhexyl Salicylate, Butyl Methoxydibenzoylmethane, Diethylhexyl Syringylidenemalonate, Limonene, Hydroxyisohexyl 3-Cyclohexene Carboxaldehyde, Butylphenyl Methylpropional, Geraniol, Tocopherol, Tetrasodium Glutamate Diacetate, Sodium Phytate, Phenoxyethanol, Benzyl Alcohol, Sorbic Acid, Sodium Hydroxide, Citric Acid, Sodium Chloride, Peg-18 Glyceryl Oleate/Cocoate, Red 33 / CI 17200, Red 4 / CI 14700. Aqua, Sodium Laureth Sulfate, Sodium Chloride, Glycerin, Cocamidopropyl Betaine, Parfum, Cocamide Dea, Benzophenone-4, Citric Acid, Magnesium Nitrate, Magnesium Chloride, Methylchloroisothiazolinone, Methylisothiazolinone, Geraniol, Limonene, Hexyl Cinnamal, CI 14700, CI 17200. Both hand washes have a lifespan of 12 months once opened. As you can see, the list of ingredients in the Molton Brown hand wash is substantially longer than that of the Abbott & Broome hand wash, and one thing I notice straight away is the lack of flower extracts or natural ingredients used in the Aldi hand wash. 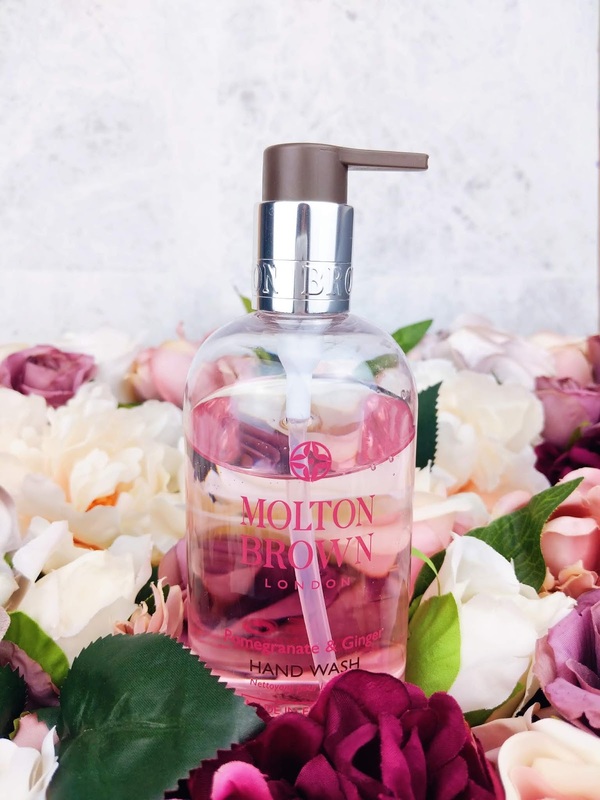 This is also reflected in the scent of the hand wash. As soon as I open the bottle of Molton Brown, there is this lovely flowery scent that smells ever so natural, whereas all I can smell with the hand wash from Abbott & Broome is soap which is a bit of a let down for me. 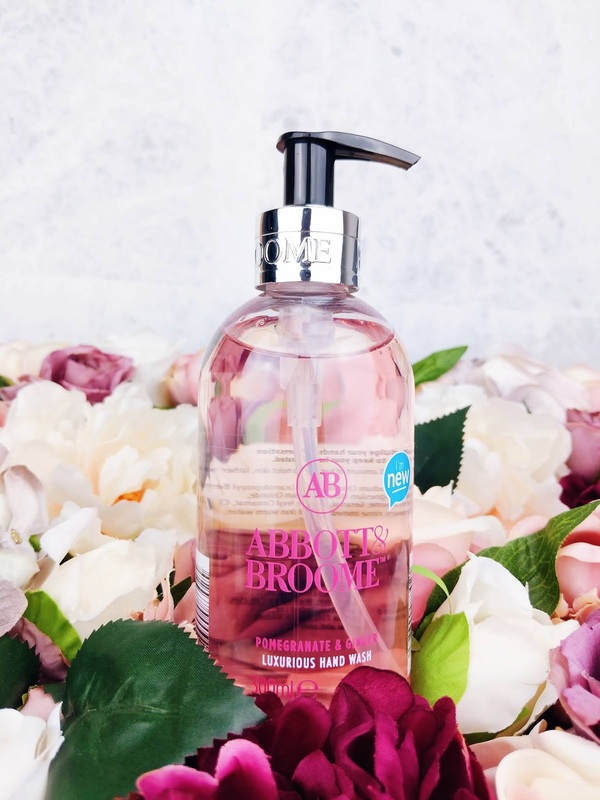 When using the hand washes, I find that the Molton Brown hand wash just lathers up that little bit more, and I have noticed a difference in how my hands feel afterwards, with the Abbott & Broome leaving my hands a little bit more dry and less nourished. This is all down to the quality and quantity of the natural ingredients. 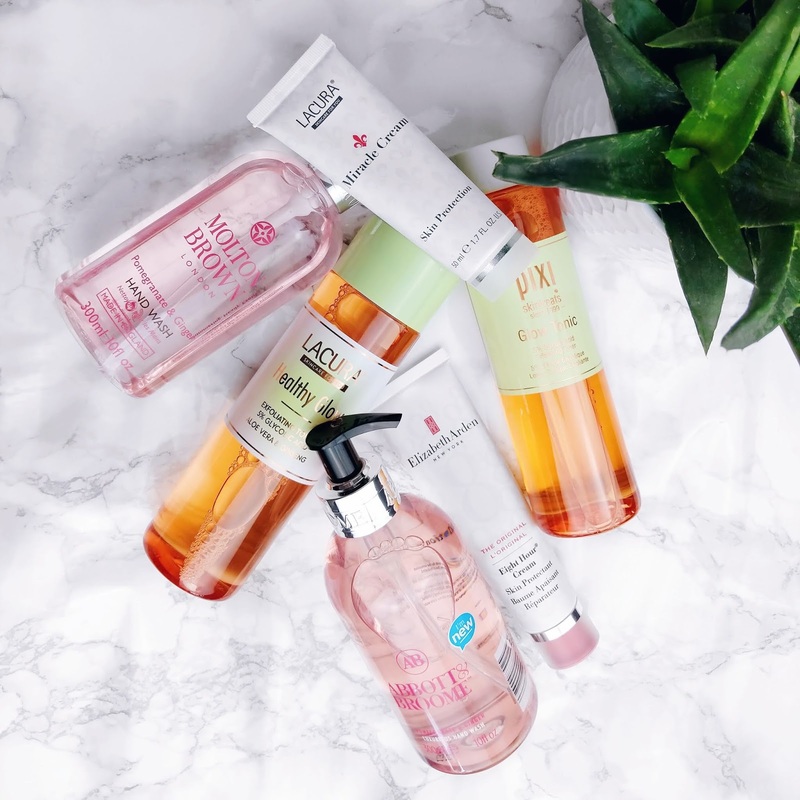 Having compared these three products, I can say that I am not unimpressed with Aldi, especially when it comes to the Lacura Healthy Glow which contains very similar active ingredients as Pixi's Glow Tonic and appears to be working well. 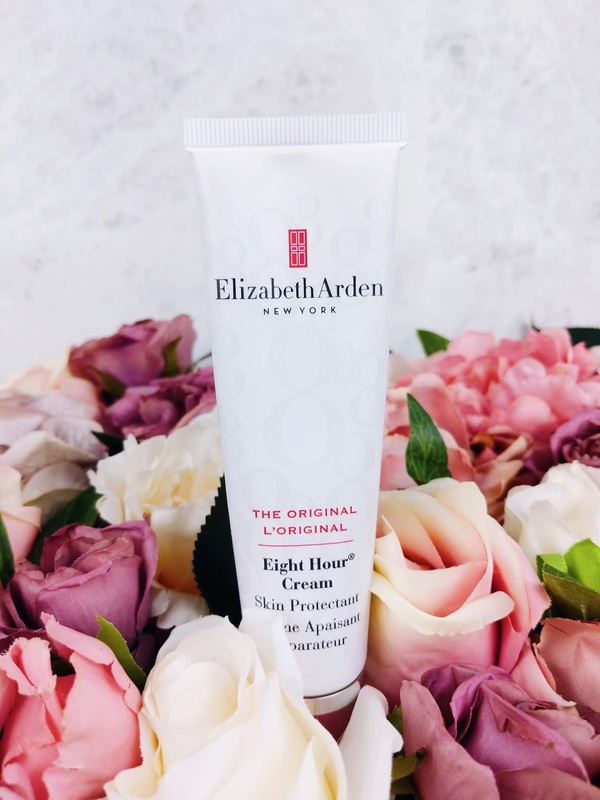 The Miracle Cream offers decent skin protection, albeit for a shorter amount of time than the Elizabeth Arden's Eight Hour Cream, but is definitely good value for money when comparing the price. Aldi's hand wash however has been a let down so I will not be repurchasing that one. So based on the quality of the products, I can't not recommend the Lacura Healthy Glow toner and the Miracle Cream, especially if you are not that fussed about the amount of natural ingredients in your skincare products. However, although I am aware that it is hard to come up with a new innovative product with so many others out there in the big world of beauty, I cannot stand by and agree with blatant copying the way Aldi has done in these cases, especially when it comes to the packaging. Come on Aldi, you could have been a little more inventive on that part! I am all for saving money and trying out bargain products, but create your own instead of jumping on someone else's bandwagon, so it's a no to the dupes from me. What is your opinion on dupes? I would love to hear all about it, so please feel free to leave a comment below. As always, thank you so much for reading (and making it through this lengthy post!). I hope you enjoyed this one. Love the review/comparison. I don't mind dupes but there must be something different about it, even if it's the packaging.